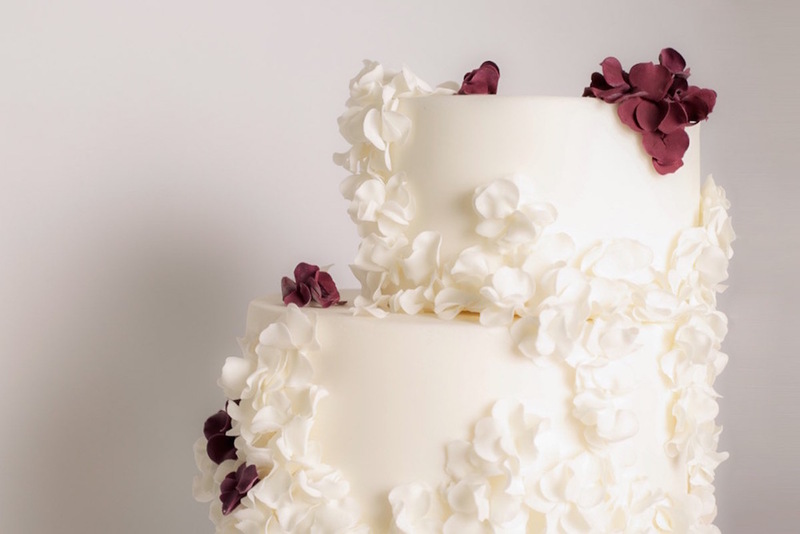 Each of Sonnda's wedding cakes is handmade, bespoke to order from her Glasgow studio. A classically trained pastry chef with some of the best names in the industry on her CV, Sonnda marries the techniques and traditions of classic French pâtisserie to the very best of Scottish produce. The results are cakes with elegant flavour combinations, exquisite taste and texture: cake that is as beautiful to eat as it is to behold. 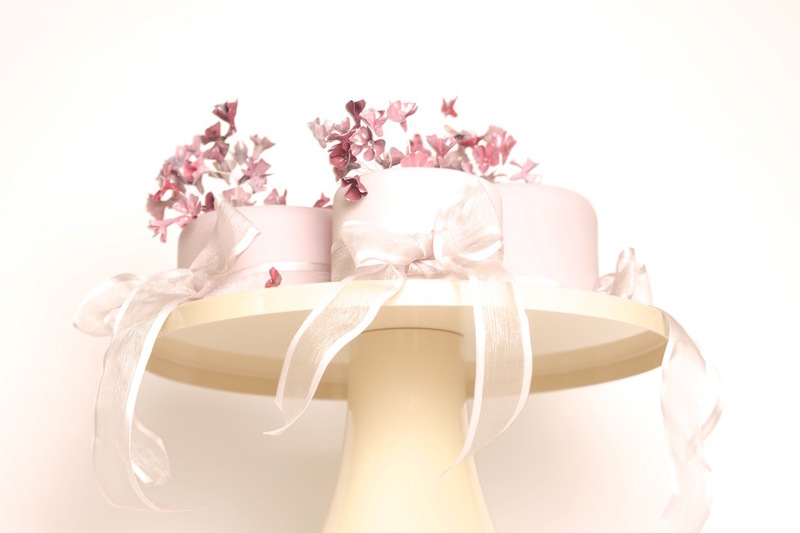 Trio of white cakes with sugar peony, ivory and peach roses and silvery-green foliage to match the flowers in the bride's bouquet and pearl detail to tie in with the pearls in her hair. Ombré ruffles in the palest blue with handmade, handpainted sugar butterflies in blue metallics. 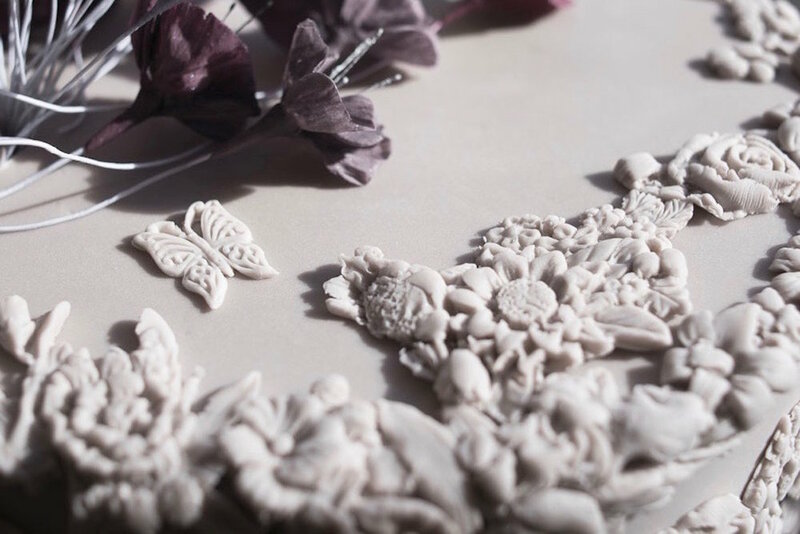 Incredible detail in handmade, handpainted sugar butterfly. 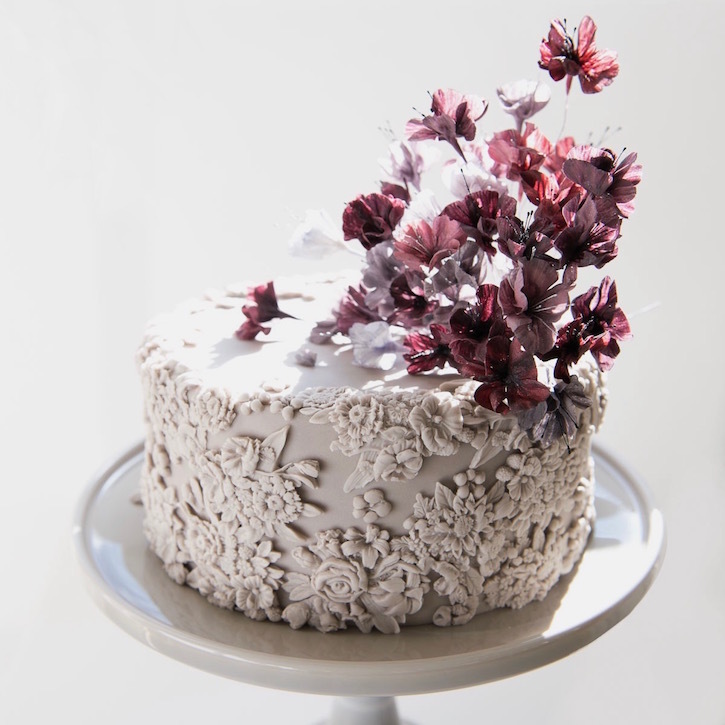 Wedding cake in soft mauve/mushroom with floral appliqués and a profusion of sugar blossoms from the palest lilac through to deep plum. Image by stillmotion. A close up of the detail in the floral appliqués. Image by stillmotion. Detail shot of sugar blossoms. Image by stillmotion. Detail to top of cake. Image by stillmotion. Detail and visual interest on the back of the cake. Image by stillmotion. Featuring "torn paper" ruffles in sage to bone ombré, with peach garden roses. Detail shot of handmade sugar garden roses. Detail shot of "torn paper" ruffles, in sage to bone ombré. Pretty and petite. 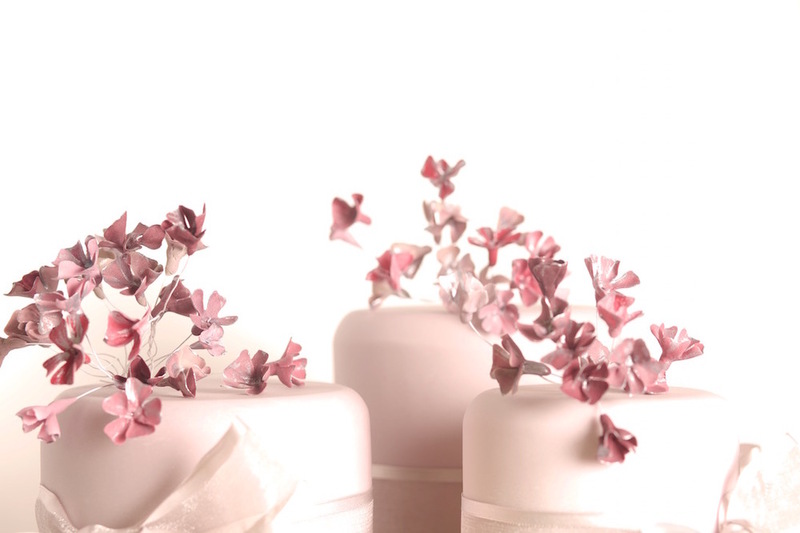 Trio of lilac wedding cakes with sugar blossoms in plum, pink and mauve. Image: PJ Phillips Photography. Featuring white and aubergine blossoms. Image by PJ Phillips Photography. Featuring blue ombré ruffles with accents of aubergine and grey, topped with a fantasy blue sugar peony. Image by stillmotion. 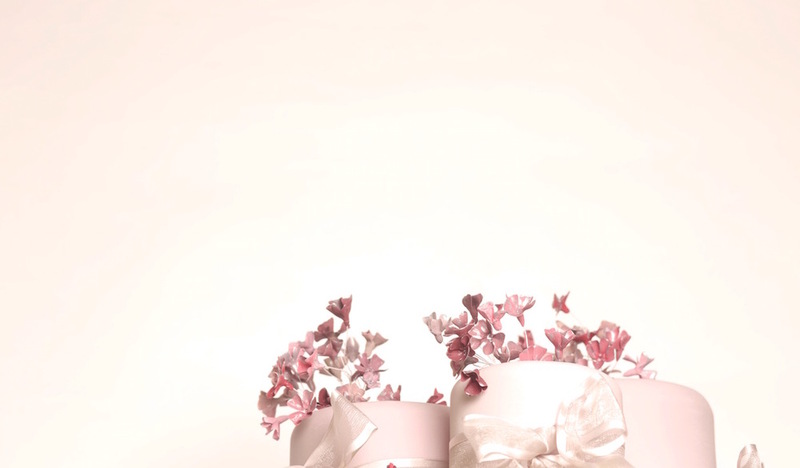 Ruffle detail. Blue ombré ruffles with accents of aubergine and grey, edged with silver. Image by stillmotion. Garlands of raspberries and blossoms, trailing and climbing like they do in nature. In white and pearl with grey and black accents, to tie into the couple's wedding theme. 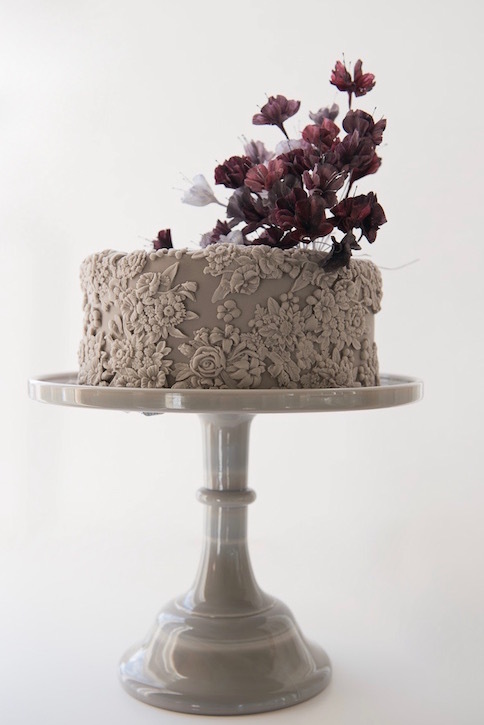 Dove grey wedding cake with lilac and pewter blossoms. Image by stillmotion.